We love this recipe. I use a brownie recipe from scratch most of the time, but this one works in a quick pinch and is almost as good as the made from scratch recipe. cake mix and nuts in large bowl. Stir in 2/3 cup evaporated milk and butter (batter will be thick). Spread half of batter into ungreased 13 x 9-inch baking pan. caramel topping and remaining evaporated milk in small saucepan over low heat, stirring constantly, until warm. 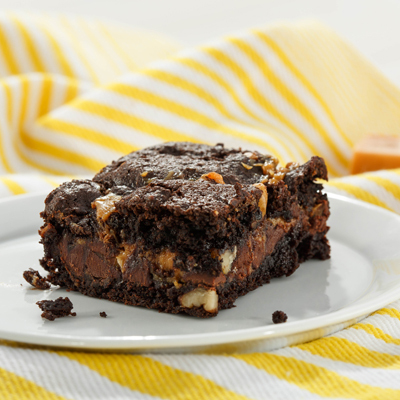 Sprinkle morsels over brownie; drizzle with caramel mixture. remaining batter by heaping teaspoon over caramel mixture. for 25 to 30 minutes or until center is set. Cool in pan on wire rack. Cut into 24 squares.